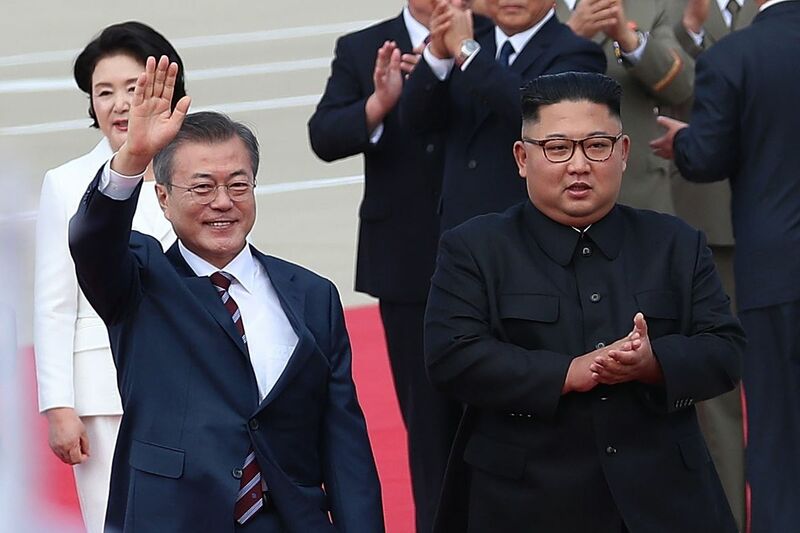 South Korean President Moon Jae-in and North Korean leader Kim Jong Un in Pyongyang on September 18, 2018. The leaders of North and South Korea, Kim Jong Un and Moon Jae-in, are meeting for a historic summit in Pyongyang â" and it began as a deeply emotional event. Itâs the first time South Koreaâs president has traveled to Pyongyang, and thereâs good reason for Moon to have made the trip. Talks between North Korea and the United States over how to dismantle Kimâs nuclear arsenal have stalled, so Moon tra veled north in part to get negotiations back on track. But heâs also there to discuss sensitive matters in the Seoul-Pyongyang relationship, mainly how to live in peace despite the threat of nuclear war â" and even possibly the reunification of the two countries that have remained formally split since 1945. Thatâs what makes the images coming out of Pyongyang so stunning. 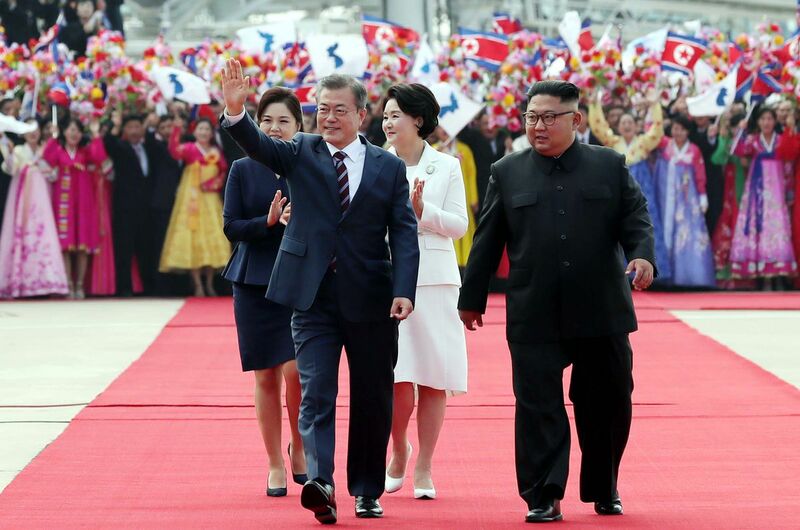 Moon and Kim embraced, drove together through the streets of the city amid fanfare and waving flags, and have received standing ovations wherever theyâve gone. Of course, North Korean authorities usually threaten their citizens to act happy and appreciative when theyâre near Kim, so it may not be as genuine as it appears. Here are so me of the most powerful images of the historic event. 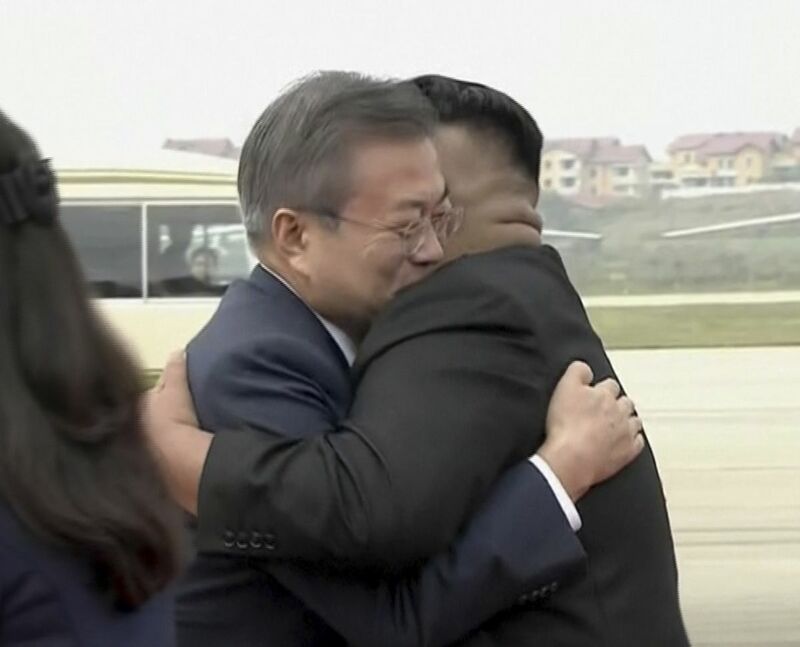 North Korean leader Kim Jong Un and South Korean President Moon Jae-in hug on the tarmac at Pyongyangâs airport on September 18, 2018. This is the third meeting between the two leaders, but itâs the first time theyâve met in the North Korean capital. And Kim made sure to warmly welcome his South Korean counterpart to his home. North Koreans along the Pyongyang streets shouted âMotherland! Reunification!â The message Kim wants to send to Moon is pretty clear: Working on peace between the two nations â" and possibly the eventual reunification of the divided peninsula â" is something Kim wants. At one point, a member of Kimâs team handed Moon some flowers. Moon signed a guest book on the first day of the three-day summit. âPeace and prosperity, the heart of the nation is one!â Moon wrote.